It’s been 25 years since these questions opened the seminal paper Communities of Commitment: The Heart of Learning Organizations by Peter Senge and Fred Kofman. These questions persist today, as addressed in my last blog. I explored ideas by the authors and developed a framework that identified and examined some of the thinking and areas of focus for developing a learning organization. In that blog, we discussed five disciplines for creating a learning organization: personal mastery, mental models, building a shared vision, team learning, and systems thinking. Additionally, we explored ways to dissolve three frozen thinking patterns: reactiveness, competitiveness, and fragmentation. In sum, we noted the dimensions of a learning culture that require a different kind of leadership, beyond a single leader—leadership as a cultural norm. 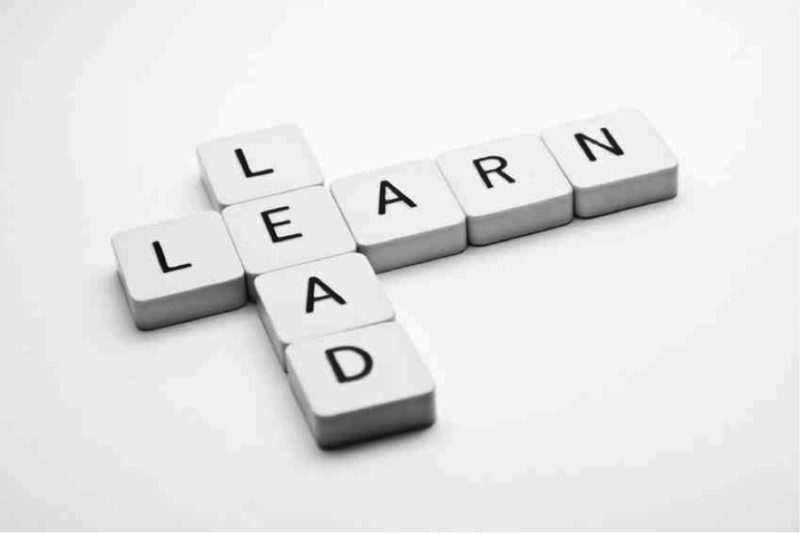 In a learning organization, leadership is expected from everyone and cultivated by the organizational leaders. Before cultivating leadership can occur, a learning community or culture must begin with commitment. Recall the name of the authors’ paper. Commitment, in this case, is not an obligation, burden, or form of compliance. It is more than the time or finances invested, and it transcends goals, achievements, or sentimental compliments. We often view commitment as something external or outside of us—something we do or accomplish. Our view of commitment requires nothing less than a new paradigm. Buddhism’s view of commitment is a vow to embrace, as a way of life, who we are, how we live, how we show up. Commitment empowers us to act in the face of our fears and justifications to face whatever we are experiencing, now, in the moment. In the Buddhist view, a commitment to something larger than satisfying our desires can provide us with a sense of purpose that can be very comforting and calming and can guide us. Until leaders become more comfortable with not knowing, learning will occur as a threat. This is where cultivating commitment is a fundamental first step to establish a context bigger than our personality, or identity. Commitment grounds the journey of becoming a learning community. It supports the leadership to 1) generate a shared commitment within the organization and 2) to tap the individual commitment of all participants. Commitment provides a larger context to create the possibility of learning, offering a way to dissolve the fragmentation, reactiveness, and competitiveness (see last blog) that tend to impede learning. 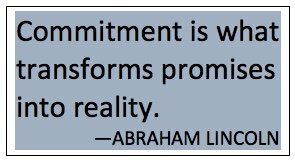 I offer a three-dimensional view of commitment that supports what’s possible in a learning culture, community, or organization. A personal commitment can supplant any fear of learning or change or personal needs and desires, which can involve how we look or our need to impress, perform well, or do the right thing. 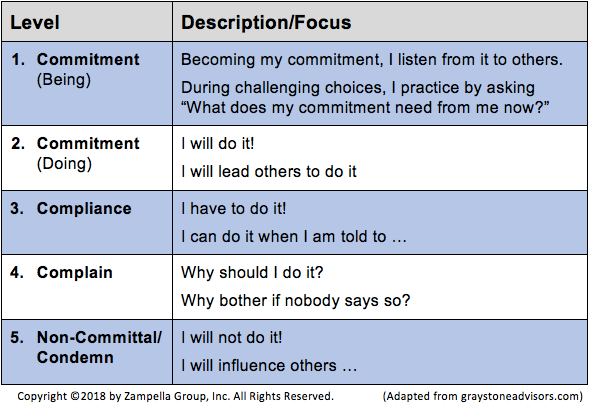 In this sense, commitment taps into our character, which is more timeless and value-based than timely and style-based. A shared commitment offers participants membership in an organization or culture that provides a larger perspective to guide our individual concerns. In this sense, commitment is a matter of direction, linked to a purpose and a compelling future that we are co-creating together. A commitment to change is described by the authors as a commitment “to changes needed in the larger world and to seeing our organizations as vehicles for bringing about such changes.” In this sense, commitment forms a crucible for change, stemming from a shared understanding that reflects a willingness to communicate, be accountable, and take the action that results from growth and development. To hold commitment in this way requires leadership. The authors of Communities of Commitment: The Heart of Learning Organizations offer a three-dimensional view of leadership to cultivate learning communities. 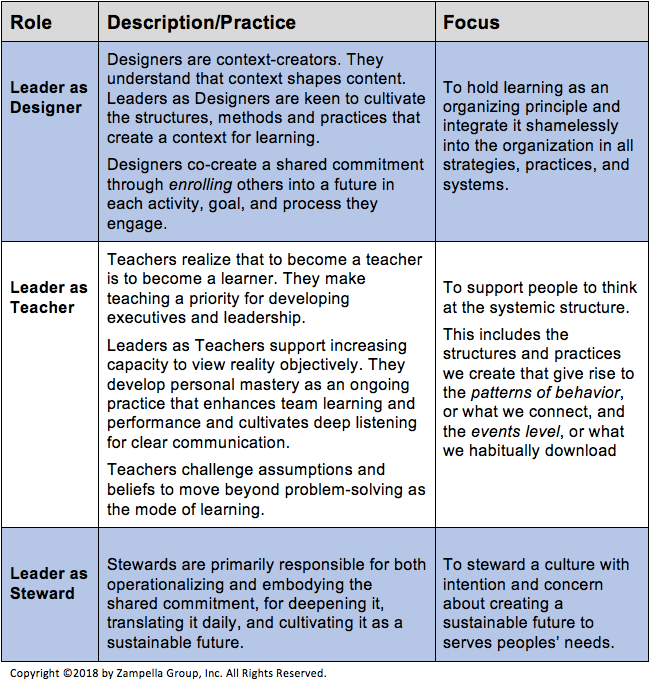 These three dimensions include leaders as Designers, Teachers, and Stewards. Designers build a foundation of purpose and core values (governing ideas) to create future. This future is not certain, or even predictable. It is an opening leaders design with others from a possibility. Designers develop policies, strategies, and structures that translate governing ideas into action. Designers co-create a shared commitment through enrolling others into a future in each activity, goal, and process they engage. Designers develop learning methods and practices that involve coordinating action and collaborating on high-performing teams to achieve goals or to serve others. This practice translates both to working together optimally and belonging to a shared commitment. Designers shamelessly integrate learning into the organization, not seen merely as the latest fad, tactic, technique, or fix. Today, the idea of learning is analogous to how we viewed IT two decades ago. Back then, the MIS department was in the basement with technicians we called when we had a computer or software glitch. Now IT is central to operating “smart” businesses. Like IT today, the notion of learning must be fundamental to what’s possible in the organization. It is an organizing principle, integrated into all elements of strategy and structure, culture and practices, supply chains and marketing plans. The possibility of an organization’s growth and direction depends on its capacity to learn to learn, and to learn together. The challenges of the second dimension, “leader as teacher,” are best presented in two parts: The Challenge of Teaching and Leaders as Teachers. Becoming a teacher is perhaps the area where many executives stumble. I’ve discovered many reasons for this. Teaching is simply not a priority for those in the C-Suite; it is typically outsourced to Human Resources or to other off-site workshops or retreats. — To become a teacher is to become a learner. In a learning community, teaching arises from learning. This requires dissolving our identities as “experts,” letting go of “knowing,” and cultivating deep listening that manifests in openness. Moments of silence, confusion, or irritation are all moments for learning that guide teaching and ultimately, leadership. — Many view the art and practice of teaching as an optional style or technique or consider learning organizations as yet another organizational design. They perceive these as enacting different policies or missions. This is akin to rearranging the deck chairs on the Titanic. — Many executives and managers view leading this kind of organization from an “individual” role or perspective. Cultivating a learning organization requires focusing beyond any individual model of leadership. Indeed, it calls for servant leaders—team learners who cultivate service and commitment. Leaders as teachers are required to reach beyond the hierarchal model where vision, information, and decisions are directed by, or funneled through, a single position or role. After accepting the challenges of teaching, we can examine how to become that leader as teacher who cultivates team learning. — Support people to achieve views of reality that are more accurate, insightful, and empowering. — Shift from a problem-solving model of learning to a possibility-inquiry mode that encourages us to live in questions rather than seek out answers. — Support people to think at the systemic structure. 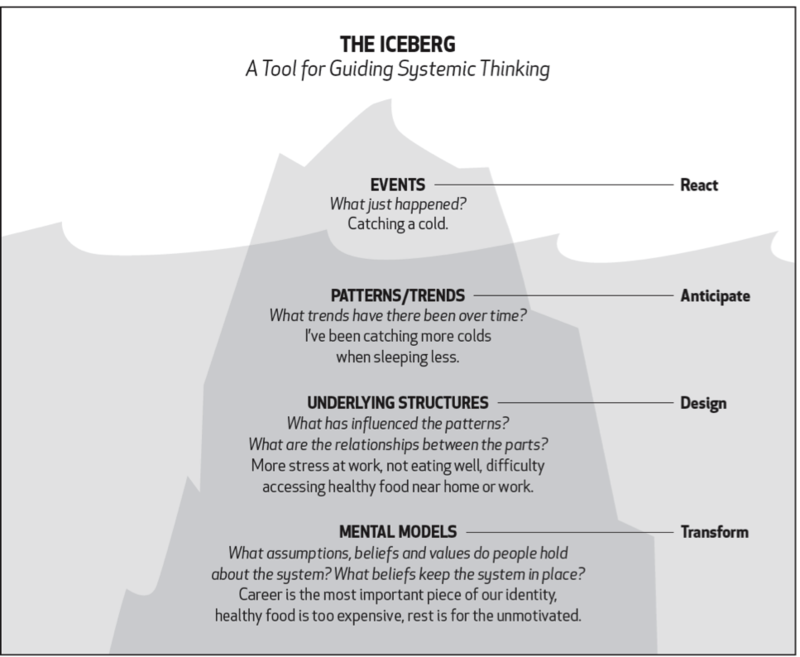 This includes surfacing the structures and practices we create that give rise to the patterns of behavior, or what we connect, and the events level, or what we habitually download (see diagram below). —Surface people’s mental models by challenging assumptions and beliefs to include worldviews (model of reality), frames of reference (points of view), and mindsets (orientations to reality). The reactive stance in management is evident in the fixation on problem solving. Many managers think that management is problem solving. But problem solving is fundamentally different from creating. The problem solver tries to make something go away. A creator tries to bring something new into being. To reiterate, leaders as teachers requires a grounded and accessible commitment, as distinguished above, to offset the fears and challenges we experience when confronted by the unknown. A commitment to something larger than ourselves provides a larger context from which to view setbacks, frustrations, or struggles. We begin to reframe our setbacks from “something is wrong” that needs to be fixed to “something’s missing” inside of realizing a designated commitment or possibility. The leader as steward is primarily responsible for both operationalizing and embodying the shared commitment, for deepening it, translating it daily, and cultivating it as a sustainable future. The steward expands their commitment and responsibility for the vision—not as owned by the leader but as a shared-vision that lives in the community through its commitment. These trustees also manage this vision for the benefit of others. Stewards are rare, yet if more leaders expressed stewardship in business and government, we would spend less time on individual gain and self-serving achievements and more time on care and concern about creating a sustainable future that serves peoples’ needs. Having spent some time examining leaders as stewards, I suggest a previous blog on servant leadership and offer these books: Stewardship by Peter Block, and Servant Leadership by Robert Greenleaf. To begin the path of becoming a leader as teacher I offer The Courage to Teach and The Hidden Wholeness by Parker Palmer. Learning occurs between a fear and a need. Only in a community can we accept the necessary challenges to grow beyond our assumptions, receive support to experiment, and learn the practices to sustain commitment. A learning community is not a mere sentimental view of being human, although it often reveals that dimension. Designing this culture requires personal mastery and rigorous practices in areas of listening, focusing energies, developing patience, and seeing reality objectively. Personal mastery also requires the willingness and openness to collaborate and serve on high-performing teams and to be held accountable in candid and clear communications. It is not something you possess—it is a practice, a lifelong discipline. Who we are as leaders of a learning organization begins with our view of leaders as designers, teachers, and stewards. As a practice, these are the kind of questions that support the path to unlearning that creates the openness to learning together. Am I willing to suspend certainty to venture into the unknown? Am I willing to acknowledge my beliefs, discover the assumptions supporting them, and then question those assumptions? Finally, am I coachable? Will I try something new or different to discover what’s possible?